Made famous by the late great Paul Daniels, the Chop Cup is a wonder to watch due to its elegance and simplicity. We're pleased to be able to offer you this wooden, quality turned cup, with a beautiful lacquered finish. The cousin of the standard Cups and Balls, Chop Cup routines are performed with just one cup, and the mechanical construction of the cup allows you to perform varied effects, visual penetrations, productions and vanishes of a ball from under the cup in a simpler yet very effective way. The gimmicked cup has a magnet inside and when a magnetic ball is used, the ball will stick inside to the top until the cup is set down with a little bump to the table, which releases the ball. Used to show no ball beneath the cup, with a magical appearance of the ball at will when the cup is lifted after the 'bump'. 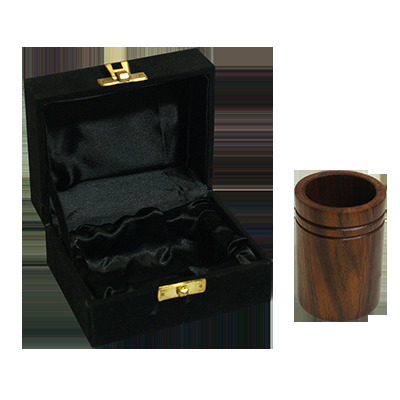 The cup comes in a black case; the case is padded on the interior with black fabric, and the exterior is a black felt with a brass latch, and is a must for avid collectors and magicians looking to add a simple yet effective illusion to your arsenal.